Purpose: To acquire the skill of getting a single exact question answered despite diversions. Have you ever asked a question and not gotten an answer? This can be upsetting, as the communication cycle is incomplete and is left suspended. In social or other situations, it is important to be able to get your question answered and complete cycles of communication. This drill gives you that ability. 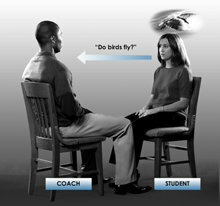 Position: Student and coach seated a comfortable distance apart. Training Stress: One question and student acknowledgment of its answer in one unit of time which is then finished. To keep the student from straying into variations of question. The student is flunked if he or she fails to get an answer to the question asked, if he or she fails to repeat the exact question, if he or she Q-and-As with excursions taken by the coach. Each time a question is repeated it exists, theoretically and purely, in its own moment of time and is uttered itself in present time with its own intention. When a student is being a machine, simply repeating a question over and over again, there is no intention there. Therefore, when one is repeating a question, it must be expressed in present time as itself with its intention. If a question is always uttered in present time it could be said over and over again without any problem. If a question is repeated over and over with no new intention it becomes arduous. When the question is not answered, the student must repeat the question until he gets an answer. Anything except question and acknowledgment is flunked. Unnecessary repeating of the question is flunked. A poor delivery of the question (e.g., lack of intention) is flunked. A poor acknowledgment is flunked. A Q and A is flunked (as in example). Student upset or confusion is flunked. Student failure to utter the next question without a long communication lag is flunked. A choppy or premature acknowledgment is flunked. Lack of an acknowledgment (or with a distinct communication lag) is flunked. Any words from the coach except an answer to the question, “Start,” “Flunk,” “Good” or “That’s it” should have no influence on the student except to get him to repeat the question again. 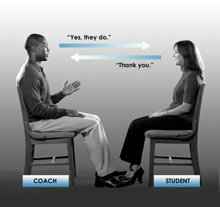 “Start,” “Flunk,” “Good” and “That’s it” may not be used to fluster or trap the student. Any other statement under the sun may be. 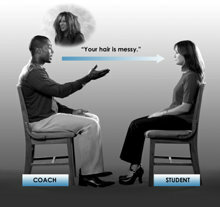 The coach should not use introverted statements such as, “I just had a realization.” “Coach divertive” statements should all concern the student, not the coach, and should be designed to throw the student off and cause the student to lose control or track of what the student is doing. The student’s job is to keep the drill going in spite of anything, using only question or acknowledgment. If the student does anything else than the above, it is a flunk and the coach must say so. When the student can consistently get his question answered despite diversions, he has passed this drill. hard to accomplish; requiring strong effort. literally, causing a change in the route or path of something. Used figuratively to mean taking somebody’s mind off something and drawing attention to something else.